In our Portuguese courses the most important thing is the student, that’s why we work in reduced groups. Our teacher analyse the needs of our students to develop the contents of the course. If you already have some Portuguese language skills, you can take our free test to ascertain your level. Please, contact us if you have any questions or wish to make an appointment. 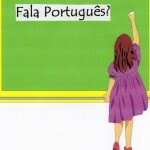 Learn Portuguese with us in small groups (an average of 5 participants)! The 3 months (= 12 double lessons) costs 165€. Schould you have any special time requests, don’t hesitate to contact us: we’ll try our best to offer you the perfect course! Pleas note: one appointment has a minimum of 60 or 2 x 45 minutes. A package of 10 x 45 minutes therefore means 5 appointments.